Description: A herb which keeps growing from year to year. It has a well developed taproot. The leaves have stalks. The leaves are 2.5-30 cm long. They are sword shaped and taper to the tip. They can have teeth along the edge. The leaves have 3-7 easy to see veins running along them. The leaves have soft slender hairs. The flower stalks do not have leaves. The flower stalk is usually longer than the leaves. The flower stalk is usually deeply furrowed. The flowers are yellowish. Notes: Considered to be an indicator of agriculture in pollen diagrams, P. lanceolata has been found in western Norway from the Early Neolithic onwards. Something that is considered to be an indicator of grazing in that area. 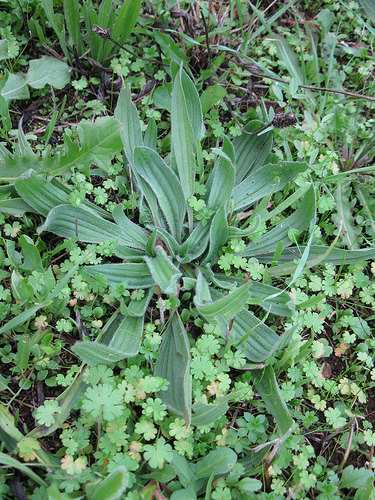 Edible Uses: Young leaves – raw or cooked. They are rather bitter and very tedious to prepare, the fibrous strands are best removed prior to eating. The very young leaves are somewhat better and are less fibrous. 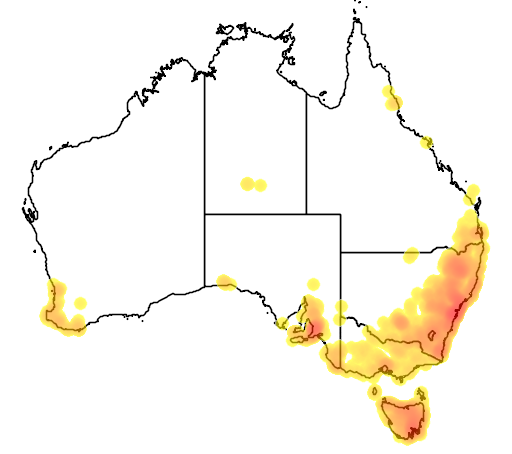 Seed – cooked. Used like sagod. The seed can be ground into a powder and added to flours when making bread, cakes or whatever. Medicinal Uses: Antibacterial; Antidote; Astringent; Demulcent; Expectorant; Haemostatic; Laxative; Ophthalmic; Poultice. 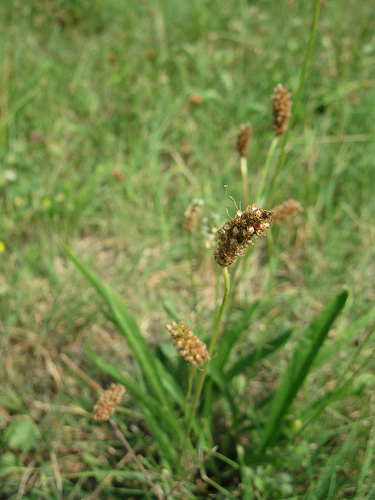 Medicinal Information: Ribwort plantain is a safe and effective treatment for bleeding, it quickly staunches blood flow and encourages the repair of damaged tissue. The leaves contain mucilage, tannin and silic acid. An extract of them has antibacterial properties. They have a bitter flavour and are astringent, demulcent, mildly expectorant, haemostatic and ophthalmic. Internally, they are used in the treatment of a wide range of complaints including diarrhoea, gastritis, peptic ulcers, irritable bowel syndrome, haemorrhage, haemorrhoids, cystitis, bronchitis, catarrh, sinusitis, asthma and hay fever. They are used externally in treating skin inflammations, malignant ulcers, cuts, stings etc. The heated leaves are used as a wet dressing for wounds, swellings etc. The root is a remedy for the bite of rattlesnakes, it is used in equal portions with Marrubium vulgare. The seeds are used in the treatment of parasitic worms. Plantain seeds contain up to 30% mucilage which swells up in the gut, acting as a bulk laxative and soothing irritated membranes. Sometimes the seed husks are used without the seeds. A distilled water made from the plant makes an excellent eye lotion. Other Uses: Dye; Fibre; Starch. A good fibre is obtained from the leaves, it is said to be suitable for textiles. A mucilage obtained by macerating the seed in hot water used as a fabric stiffener. Gold and brown dyes are obtained from the whole plant. A great food for stir fry or soup all year round! We love it. Would like to see the food value listed somewhere! I have used ribwort 4 a really bad spider bite that no other herb helped. I became aware of ribwort as a remedy that cures skin infection and as I’m informed has been known to treat skin cancer by placing leaf over the sore continuously until the cancer is gone, this takes some time but it seems to have successful results. I was shown by an older fellow that has been farming land in Victoria all of his life, third or fourth generation to the land.. They generally have a few good tricks up their sleeves. I have suffered for 4years with a blocked right ear. It would block 4 or 5 times a day and drive me nuts. The ENT specialist diagnosed mucous congestion and suggested the only treatment would be grommets. I coped by using a Neti pot each time it blocked. Away on holidays I happened upon a health shop and in desperation (hard to use neti pot as you travel) asked the lady there if she had any thing for excess mucous. She gave me Ribwort in a tincture and after taking for 14 days I have not had a blocked ear for now 6 weeks! Amazing.